bp Magazine is an award-winning quarterly mental health magazine focusing on bipolar disorder. Every year more and more Americans are diagnosed and treated for bipolar disorder. 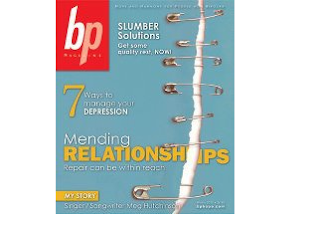 Like the bp Magazine for Bipolar's Facebook page and get a free digital copy of our Winter 2012 issue featuring "Mending Relationships" and "Slumber Solutions."